Do you want to get started with WordPress to create your website? WordPress is the most popular content management system (CMS) and website builder in the world. In this article, we’ll share how to install WordPress using multiple platforms. WordPress is used by more than 30% websites in the world, which makes it the most-used software to create a website. It’s easy to set up and helps launch websites or blogs quickly. WordPress has 2 types: WordPress.com, which is a hosted solution; and WordPress.org, also known as self-hosted WordPress. We’ll use self-hosted WordPress in this guide. Many good WordPress hosting companies offer 1-click installation setup for WordPress. However, the setup process is different for each hosting panel. Before you can install WordPress, you’ll need to purchase a domain name and web hosting. We recommend Bluehost for web hosting. It’s one of the most popular hosting companies in the world, and it’s also officially recommended by WordPress. For our users, they’re offering a free domain name, free SSL certificate, and 60% OFF on web hosting. After purchasing your domain name and web hosting, you’re ready to install WordPress. Fantastico is available in multiple web hosting control panels. 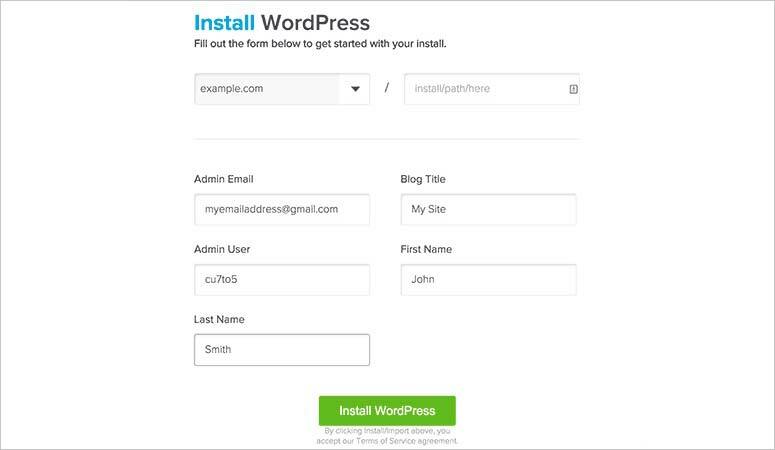 It’s an auto-installer that you can use to quickly install WordPress. In your web hosting dashboard, you’ll need to look for the Software section to locate the Fantastico installer. Click on the Fantastico icon, and it’ll open the auto-installer options. Note: Different web hosting companies use different versions of Fantastico. Some are still using older versions, while others are updated to the latest auto-installer software. The difference will be in design and colors. However, the basic installation steps for WordPress are similar in all versions. You’ll see a list of all applications, including WordPress, in the left-hand menu. Simply go to Blogs » WordPress. Next, you’ll see the overview for WordPress, and a big Install button that shows the WordPress version to be installed. You’ll need to click on the Install WordPress button. Next, you’ll be asked to select your domain name, sub-directory (add this information only if you want to install WordPress in a sub-directory; if not, you can leave this field blank), username, password, and email to continue. After adding the required information, you’ll need to click on the Submit button. The installation process will begin, and a progress bar will appear on the same screen. Once the installation is done, you’ll see a success message. Note: If the latest version of WordPress isn’t installed, then you don’t need to worry about it. Once you’ll login into your WordPress admin account, you’ll get the notification to update to the latest version. 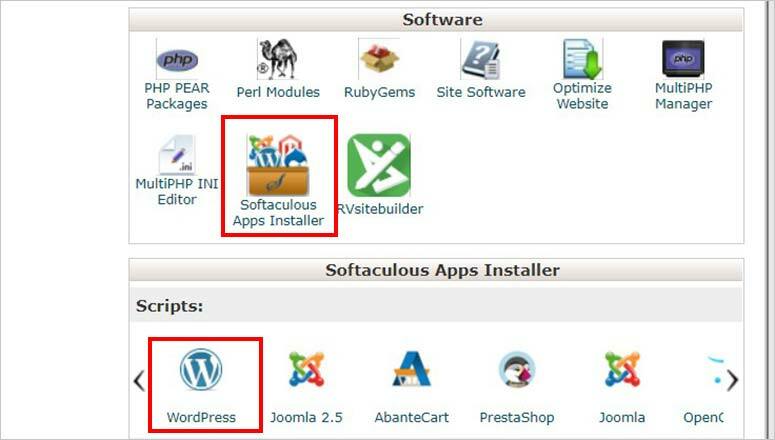 Softaculous is another WordPress auto-installer script used by multiple web hosting companies. It works similarly to Fantastico and helps you install WordPress right away. Many big hosting companies like SiteGround, InMotion Hosting, etc. offer Softaculous in their web hosting dashboards. You’ll need to login into your web hosting control panel and search for Softaculous in the Software section. In some control panels, you’ll also find a Softaculous Apps Installer section separately with all apps visible in your dashboard. It’ll allow you to directly click on WordPress and install it. You can choose any option to install WordPress. If you click on the WordPress icon under Softaculous Apps Installer section, then it’ll show you an overview of WordPress. There are other tabs like Install, Features, Screenshots, etc. Visit the Install tab to get started. First, you’ll need to select Http:// or Http://www protocols. If you’re using SSL and HTTPS, then simply choose Https:// or Https://www from the protocol dropdown. Next, you’ll need to select the domain name where you want to install WordPress. After choosing the domain name, you’ll need to add a sub-directory (for example: mywebsite.com/wp) where you want WordPress to be installed. A directory will automatically be created with the name you define and WordPress will be installed there. However, if you’ll be installing WordPress on your root directory (for example: mywebsite.com), then leave the In Directory field blank. Now that you’re done with the Software Setup, simply scroll down to Site Settings. You’ll need to add the site name and site description. These details aren’t permanent and you can change them later from your WordPress admin dashboard. After that, you’ll be asked to provide a username, password, and email address to create credentials for your WordPress admin area. You can use the password generator by Softaculous to add a strong password. Also, you’ll need to make sure that the username is a non-dictionary word. However, there’s no given rule to set the username or password. You’re free to select a username of your choice and a password that you can easily remember. We recommend you to keep a strong password, so your site will remain secured from hackers. You should check out this guide on how to manage passwords for more detailed information. The email field is important because all the notifications will be sent to the email address you provide here. These notifications include update alerts, password reset, and more. Once you’re done with the Site Settings, you can scroll further to select the plugins and theme. These are optional settings and you can also manage them from your WordPress admin dashboard after the installation. Click on the Install button. In few minutes, you’ll see a success message for WordPress installation. Until the progress bar shows 100%, it’s recommended to stay on the installation screen to avoid troubles. After successful installation, you’ll see details like your website URL and WordPress admin access URL. 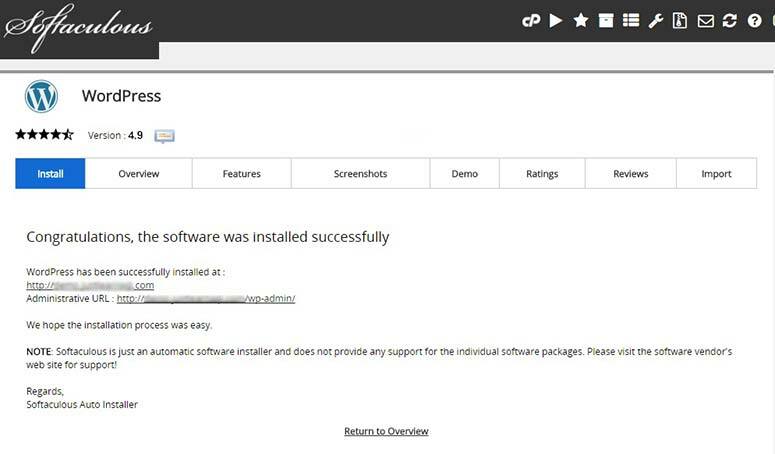 QuickInstall is an auto-installer for WordPress and many other apps. It’s available on multiple web hosting control panels including HostGator and others. Different hosting dashboards may have a different appearance for QuickInstall, but the features and process to install WordPress is almost same. You’ll need to log into your web hosting dashboard, and search for the Software section. There you’ll find the QuickInstall icon. Click on QuickInstall to continue. 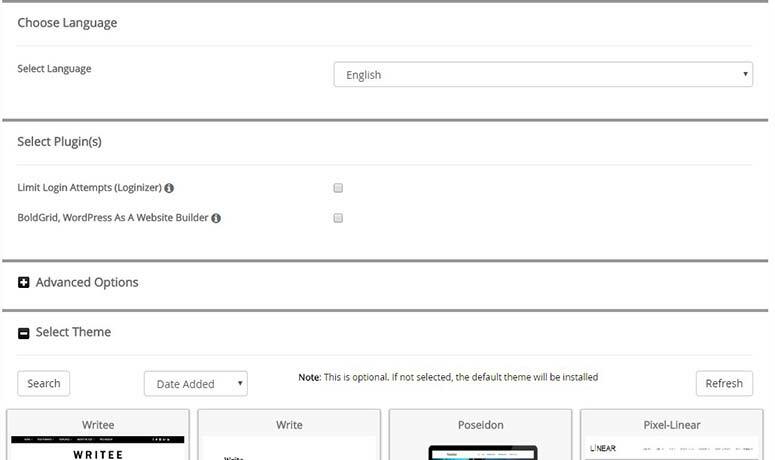 It’ll launch the QuickInstall page with all its apps, including WordPress, under the 1-Click Install section. Simply click on WordPress link to begin with it. Like many other installation scripts, it’ll show you the WordPress overview and a button for installation. You’ll need to click on the Install WordPress button. Next, you’ll need to add the required details for WordPress installation. Start by choosing the domain name where you want to install WordPress. In the next field, you’ll need to add a sub-directory. If you want to install WordPress on your root directory (example.com), then simply leave this field blank. Moving ahead, you’ll need to enter the admin email address, blog title or site name, admin username, first name, and last name. 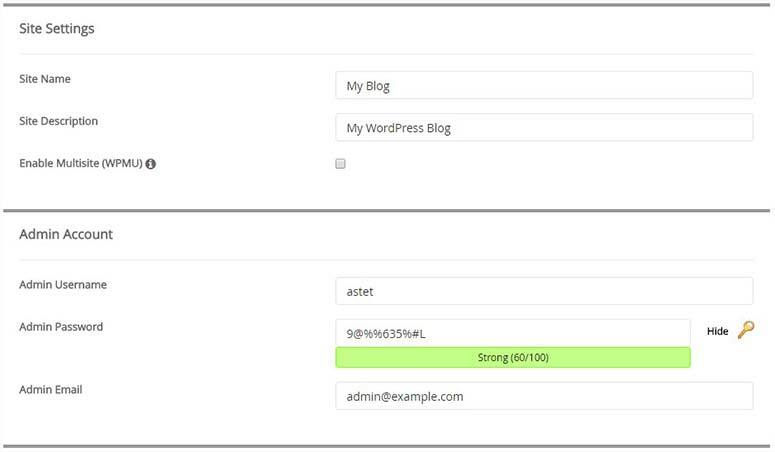 These details will be used to create an admin user for your WordPress installation. After adding your user details, you’ll need to click on the Install WordPress button. WordPress installation will begin, and it’ll take a few moments to complete the process. Once the installation has successfully finished, you’ll see the login details with URLs for your website and WordPress admin area. MOJO Marketplace supports a 1-click installer tool used by multiple web hosting companies to quickly install apps like WordPress. It is available in the web hosting control panel. If you are using Bluehost web hosting, then you’ll need to login into your hosting control panel and go to the website section. From there, you’ll need to click on the Install WordPress or 1-Click Install icon. 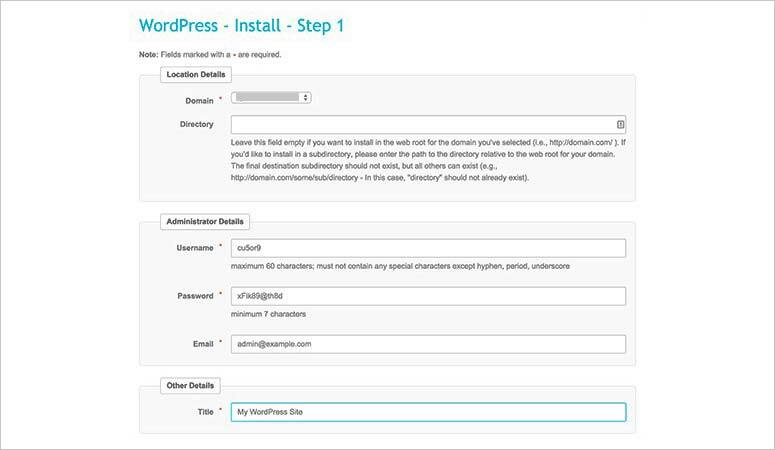 If you click on the Install WordPress icon, then you’ll be redirected to choose your domain name, and add a directory name (only if you want to install WordPress in a sub-directory like example.com/wp). Now, you’ll be asked to add admin information like Site title, admin username, admin password, and admin email address. Also, you’ll need to check mark the terms and conditions. Then, click on the Next button. A progress bar will appear at the top of the screen, and you’ll be notified once WordPress is installed. You’ll need to click on the link to view your login credentials. Once you click on the link, it’ll show you a success message and your WordPress admin access (username and password). Do you want to manually install WordPress using an FTP client? It’ll add a few more steps to the installation process. We recommend you take a look at this guide on how to use FTP to upload WordPress files for more detailed information. Before we start, you’ll need to download the latest WordPress version from their official site. Simply unzip the file and use an FTP client like FileZilla to upload the WordPress files into your root directory. Usually the root directory is called /public_html/. If you want to install WordPress in a sub-directory (For example: mywebsite.com/wp), then you can create a folder in your root directory with the respective name and upload your WordPress files there. In this case, your extension in the FTP client will be /public_html/wp. After uploading the WordPress files, you’ll need to login into your web hosting control panel to create a new database. In your cPanel, you’ll need to search for the Databases section and click on the MySQL Databases icon. In the New Database field, you’ll need to add a name of your database. After that, click on the Create Database button. Once your database is created, you’ll need to enter your MySQL username and password. These credentials will belong to your database and they’ll be used in your WordPress configuration file. Upon adding the username and password, you’ll need to click on the Create a user button. Creating a user is not enough. You’ll need to give access to this new user to connect with your database. Simply add the user to your database with all permissions. To do this, you’ll need to go to the Add User to a Database section on the same page. In the User dropdown, select the new user that you created, and select your database in the Database dropdown. After that, click on the Add button. It’ll show you the user privileges page. You’ll need to check mark all privileges for this new user to make changes on your database. First, it’ll ask you to select a language. After selecting your language, click on the Continue button. Now, the complete WordPress installation process will be in this same language. If you’re not satisfied with your language selection, you can change it later from your WordPress admin settings. Next, it’ll display the welcome message and information about your new WordPress installation. 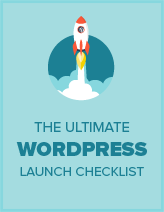 Read this information as WordPress will access your database credentials to launch properly. You’ll need to click on the Let’s go! button. Now, you’ll see a form where you’ll need to add your database name, username, and password. After that, click on the Submit button. Upon successful connection with the database, you’ll see a message from WordPress and you’ll need to click on Run the install button to continue. WordPress will run its background process that includes creating tables in your database, and taking you to the next step. You’ll need to enter your Site title, username, password, and email address to set up your WordPress site. In the development phase, you may not want search engines to see your website, so you’ll need to check mark on search engine visibility option. You can change this setting later from your WordPress admin account. Once you click on the Install WordPress button, it’ll complete the installation process and display a success message. 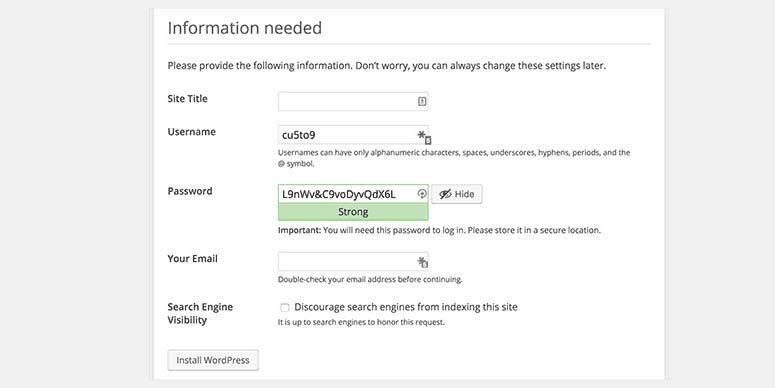 You’ll also see the login credentials to access your WordPress admin account. WordPress is translated into almost all the languages in the world. You can easily install WordPress in your own language. To name a few, WordPress includes languages such as English, French, Spanish, Chinese (Han), Japanese, Arabic, Korean, German, Hebrew, Hindi, and more. While installing WordPress, it’ll ask you to select a language and then further installation will be done in the chosen language. However, if you select English at first and want to change the language later, then you’ll need to visit Settings » General page in your WordPress admin account. You should also check out this guide on how to create a multilingual website in WordPress for more details. By default, WordPress has multisite features. You can use the multisite network to create and manage more than one website under a single WordPress installation. The WordPress multisite network is strong, and it easily manages your new sites on sub-directories or sub-domains. It’s helpful for large businesses, government organizations, membership websites, educational institutes, travel companies, and more. You should follow this complete guide on how to install and setup WordPress multisite network for detailed instructions. Do you want to install WordPress on your computer? Many beginners want to create their websites in a local server environment before showing it to other people. However, you can also build your website on a live environment by simply discouraging search engines to see your site. Other than that, there’re many people who want to install WordPress on their computer to develop themes, plugins, or test the code. Installing WordPress on your computer will not be visible to all until you take it live on your domain. For Windows users, you’ll need to download and setup WAMP to install WordPress. However, Mac users will need to setup Mamp on their computers for local WordPress installation. You should also check out our guide on how to transfer WordPress from local server to a live site for step-by-step instructions. After the successful installation of WordPress, you’ll need to select your theme and plugins to launch your website properly. A theme, or website template, will be the design / style of your WordPress site. You’ll find hundreds of thousands of WordPress themes on the internet and WordPress repository. However, it’s difficult to select a theme when you have these many choices. We recommend you sort WordPress themes according to your business niche and then check out our expert pick of the best WordPress themes. We keep this list updated, so you’ll find the latest and most amazing WordPress themes for your website. WordPress is flexible and easy to set up. It allows you to add any feature you desire on your website using WordPress plugins. Whether you want to add a contact form, optimize your website for search engines, secure your website from hackers, or any other functionality on your site, there’s a fair chance that you’ll find a plugin in the WordPress directory. Other than the WordPress repository, you can find premium plugins that are available as third-party tools on the internet to extend functionalities on your website. Add Contact form: You’ll need to add a contact form to your WordPress website. You may also want to check out the best WordPress contact form plugins. WordPress security: Make your WordPress website secure by installing some of the best WordPress security plugins. Improve WordPress SEO: Optimize your website for SEO by using the best WordPress SEO plugins. WordPress performance: Speed up your WordPress site by installing the best WordPress caching and other WordPress performance plugins. Prevent spam comments: Stay away from spam comments by installing the Akismet plugin on your WordPress blog. Grow your website: Easily increase your website traffic and customers by using the best WordPress lead generation plugins. If you ever plan to switch domains, then check out this interesting step by step article on how to move your WordPress site to a new domain name. We hope this article helped you learn how to install WordPress. You may also want to see our guide on how to start a WordPress website from scratch (step by step).